Older female Song Sparrows (Melospiza melodia) breeding on Mandarte Island, B.C., Canada, are more often parasitized by a brood parasite, the Brown-headed Cowbird (Molothrus ater), than yearling females breeding for the first time. This may be explained if older Song Sparrows behave differently than yearlings towards searching female cowbirds, and are thus more readily recognized as potential hosts. We tested this hypothesis by measuring the responses of Song Sparrows to a stuffed mount of a female cowbird in 1982, when no cowbirds frequented the island. This mount, and a control (a female junco) were presented near the nests of wild female sparrows of known age. As predicted, adult female sparrows behaved differently towards the cowbird model from yearlings (Table 1). They did not differ in their responses to the junco. Adult males also responded differently to the cowbird and junco (Table 2), but adult males did not differ significantly from yearlings in their response to either model. When birds that responded weakly as yearlings in the absence of cowbirds were retested as 2-year-olds after the recolonization of the island by cowbirds, they responded strongly to cowbird models. Two-year-old birds not exposed to cowbirds as yearlings, were parasitized at a rate intermediate between the rate for experienced adults and that for yearlings. Yearling females were parasitized less often at the beginning of the period of breeding activity by cowbirds than at the end. All these results are consistent with our hypothesis that age-selective parasitism results from differences among age classes in the mobbing responses of Song Sparrows to cowbirds. 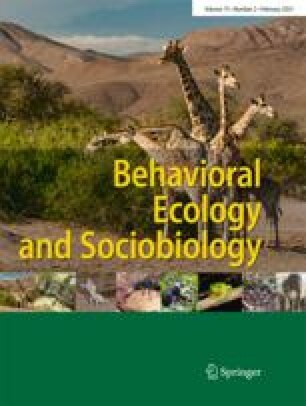 The greater response of adult sparrows to cowbirds seems non-adaptive, because it apparently results in a loss of reproductive output through selective parasitism. We suggest that this paradox can be resolved if the response to cowbirds near the nest is an instance of a more general acquired response to all potential enemies that approach a nest.